Before the San Francisco Museum of Modern Art shutters its South of Market location for three years, during which it will spend almost half a billion dollars to more than double its size for the Doris and Donald Fisher Collection, the museum’s restaurant on Third Street closes out its more modest exhibition program with nine acrylic-on-canvas paintings by Chris Shaw, on view through June 3, 2013. Shaw has used his swan-song time slot to present a series of vividly colored Madonnas, each based on Madonnas by such 15th century artists as Bellini, Botticelli, and Ambrogio de Predis. For Shaw, the Madonna is just another propaganda icon, a vessel to be filled up with whatever one is trying to sell. In Shaw’s case, his Madonnas have set aside the Christ Child for a Kalishnikov, a bottle of Colt 45, and an orange squid, whose mantle resembles the Pope’s peaked mitre and groping tentacles suggest a fallen priest’s restless reach. While the Madonna with the Kalashnikov and the one wearing a suicide bomb vest are the most obvious pokes in the eye of devout Christians, Shaw’s most subversive paintings may be his Madonnas of Science. One holds a magnet, another peers through a microscope, and a third cradles an armillary sphere, Shaw’s representation of what we think we might know about dark matter. And of course there’s a Madonna “holding” a Higgs-Boson particle, in which the son of God gets the heave-ho for the newly discovered God particle. On Saturday May 3rd, 2013, Ben Marks of CollectorsWeekly spoke with Chris Shaw in his Oakland studio about his Madonnas. TRPS: So, gotta ask, were you raised Catholic? Shaw: I was not. I wasn’t actually raised in any particular religion. I guess if there was a family religion, we were Unitarians, but that basically meant we went to the Christmas service, Easter, and that was kind of about it. But I know the stories. I grew up in the north end of Boston and I would see the Italian parades, and they’d have the Madonnas with the money. Some of those themes have carried into my work, so I know there is some of that influence coming back. It’s not personal or even spiritual. The Madonnas become a vehicle to express an idea. TRPS: So they’re similar to any other icon? Shaw: They’re almost similar to any other icon. I like the idea behind that, that basically icons can support every idea imaginable. A lot of times, when I get criticism around some of the Madonnas, people are like, ‘how can you portray Jesus as a magnet,’ or ‘how can you put a bottle of malt liquor on this? These things have sacred meanings.’ I actually know my icons pretty well. They’re this evolving story that has changed from the beginning of Christianity to where we are now. You had these heavy Masonic Madonnas and icons from before the Masons and the Catholic church split up. Right now they would be completely sacrilegious, but back then they were woven together. The symbols change, people change, and the stories change. TRPS: In South America, the Madonna is a much different symbol than it is in the United States. Shaw: Yeah, in Eastern Europe, too. They give it a whole different slant. I think that’s super interesting. Mostly, I guess, I really like the Madonnas because everybody has their own twist on them. The orthodox ones all have this very unique style, which I love to adapt, and I also really like the Italian ones and the Western European ones. Everybody’s got their version. TRPS: The Madonnas in the show have an almost Middle Ages look to them as opposed to High Renaissance. Shaw: Actually, they’re a little bit of both. The three large ones, the “Madonna of the Microscope,” the “Madonna of Evolution,” and the “Madonna of the Magnet” were all appropriated poses. The one that’s maybe the most recognizable would be the “Madonna of the Microscope,” which was a Botticelli. It was a Madonna and Child. One of the things I love about Renaissance art and particularly Italian Renaissance art is the depth of geometry that goes into them. They do a great job of rounding everything out and taking it away. That’s a pretty big influence on me. TRPS: What do you mean by rounding out and taking away? Shaw: Well, they tend to obfuscate the foundational framework, which is very angular. They use curves and shading and color to disguise the underlying structure. A lot of times, the underlying foundation of those Renaissance paintings was very symbolic and completely tied to sacred geometrical concepts that carry their own story, if you know how to read them. TRPS: When you were painting your Madonnas, did you start with the foundational geometry? Shaw: Generally, yeah. I built them up in the same way. The orthodox icons are about the most uncreative thing you can imagine. They’re completely formula. You can probably go buy a book that’ll tell you step by step how to make one. But I like that idea. It’s a very non-art idea, but I like taking that non-art idea and then twisting it, moving the arms around, switching it up. The old masters changed the central pieces, but I try to build from the bottom up in a geometric way to reconfigure the image right down to its root, to give it a new foundation. TRPS: There is this push and pull in your work between scholarship and its rejection. Shaw: Well, yeah. I carry a certain chip on my shoulder for whatever reason about definitions. When I was at the California College of Arts and Crafts, we took a lot of art history classes. You learn about all this religious art, but your work is supposed to be about your ideas, art for art’s sake in the modern world. But I like religious art. It’s pure propaganda. It’s formulaic. It’s non-original. A lot of times people think the color palette is really bad because the colors are all very symbolic, too. They’re put together for a different reason than color harmony. So in a lot of ways, religious iconography breaks almost all the aesthetic rules of modern art. That might be another reason why I choose them. I like to push this religious propaganda from back in the day into its modern equivalent that is maybe based a little bit on concept and my influences. I guess I’m more influenced by the Berninis the Botticellis the Bellinis, all the B guys in Italy, than I am by some of the better conceptual artists of today. TRPS: Let’s start with the Madonna holding the God particle as opposed to the son of God. Shaw: That one was about as straightforward as they get. Some of them actually go quite a few layers deeper in terms of the different types of metaphors that I put into the piece. But yeah, the God particle. I had to do it. How could I not make that? I’m kind of a natural shin kicker, always have been. Coming out of an art-school background where the abstract and the conceptual is the highest thing, I just naturally want to say no to that. As a poster maker, I’m supposed to make images that are supposed to affect people. White on white is not going to help me get my point across. TRPS: And posters are supposed to be functional. Shaw: Yes, they have this actual function, they’re not art for art’s sake. They have a purpose. Icons have a purpose, too, to communicate and get things across. That’s why I choose them. TRPS: We’ve talked about the God particle. Tell me a bit about the magnet. Shaw: I’m a huge fan of magnets. TRPS: So, uh, you’re attracted to them? Shaw: Yeah, I’m attracted to magnets. I love magnets in all ways. I wish I could say that painting was more metaphorical, but that one’s almost… it’s not a self-portrait but it’s a self-portrait of a lot of things I care about. The actual paint I used was all copper or iron-based only. A magnet will stick to the painting. Anyway, I had to do something with the magnet because it’s been a project of mine for a few years, to try to develop magnetic paint, which I’ve done it, but I haven’t been able to do it cheaply enough. Anyway, the curves in that piece, they’re all based on magnetic flux curves. TRPS: So, the potential symbolism of a magnet taking the place of the baby Jesus, that’s like the farthest thing from your mind? Shaw: That’s almost the farthest thing from my mind, yeah. If you’re a born-again Christian, it’ll piss you off because it’s almost sacrilegious, but that’s really not what it’s about. I used the Madonna to hold the things that I chose to comment on. She’s literally the vessel to hold these ideas, as she was with Jesus. She’s my icon. TRPS: To hear you describe it, it’s almost a benign piece. Shaw: It’s super benign, but it’s also one of the ones that bugs people out the most. The older piece that’s in the show, the “Madonna of the 40oz.” is another that really annoys people. However, that’s about the deepest painting I’ve ever made, and again, it’s obfuscated. It’s kind of turned into a cartoon in a way, but I was shot at in my corner store at point-blank range, and the guy missed. It happened the day after the Rodney King thing; it was wrong place, wrong time. I had bought my friend a 40oz, walked up to the counter, dude that stood next to me pulled out a gun, pulled the trigger, and missed. And so that piece is all about going to the corner store and meeting your maker. TRPS: What happened after the guy missed? Shaw: I dove into the chips and he took another shot at me. The guy behind the counter dove underneath the counter. The guy grabbed my eight bucks, or whatever, and my beer and the rest of the money from the cash register, and ran out the back door. I went home, smoked a joint, went back over there and made my police statement. Left: Bad Religion screen print, 2010. Right: Madonna of the Suicide Vest, 2012. 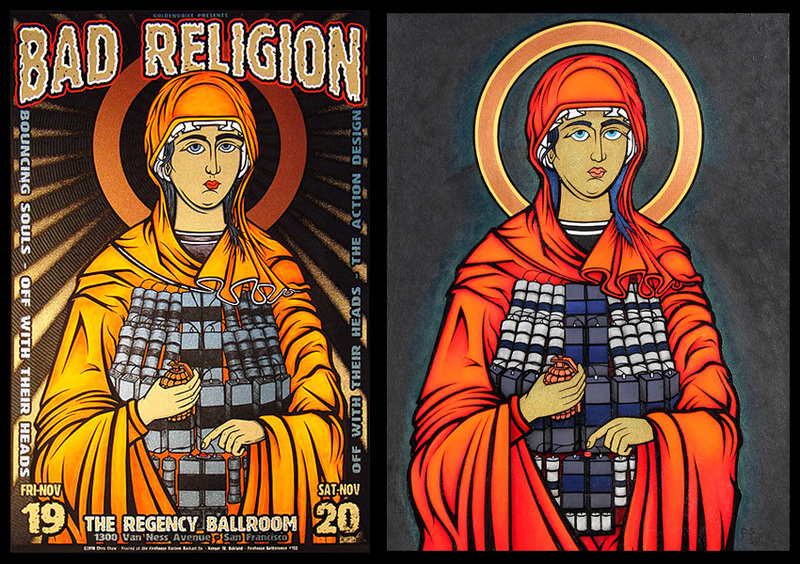 TRPS: You used the “Madonna of the Suicide Vest” for a Bad Religion poster. 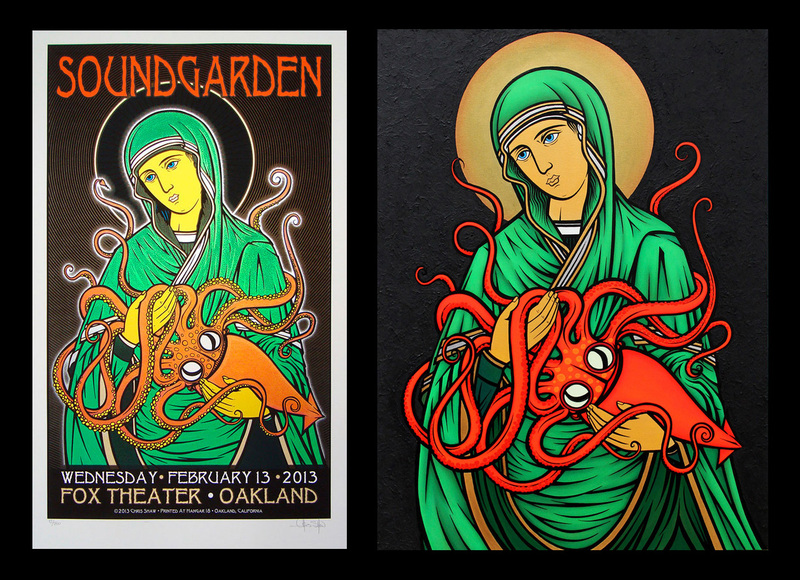 How did the “Madonna of the Squid” become a Soundgarden poster? Shaw: That was about necessity. Chuck and I were going to make these Soundgarden posters for Fox Oakland. I had been working on an image with a squid but it was going south on me. I drew it like nine different ways but didn’t like it. And then I was like, well, I could put it in a Madonna. I had painted all these Madonnas who weren’t holding anything yet. It’s like whatever they were going to hold, I had them on ice. So I incorporated the squid into it and I was like, that works. It was exactly what I needed. It was almost too easy. It’s also about the most religiously subversive painting I’ve made. Shaw: It’s all about the pope. It’s all about the pope and the pope is the monster. The shape of the squid’s body is the same as the pope’s hat. People started figuring that one out. Left: Soundgarden screen print, 2013. Right: Madonna of the Squid, 2013. TRPS: As an artist, if you use Madonnas in a series of paintings, you have to be prepared for the fact that there are people for whom that image means specific things and will never mean anything else. Shaw: It’ll never mean anything else. I get off the BART train sometimes and there’s a Filipino guy there selling newspapers. Underneath his little desk-cart thing, he has a shrine of the Madonna. And every time I walk by I go to check it out. He keeps it up and moves it around and stuff. My intention is not to piss that guy off. I actually really like what he’s doing. I think that’s cool. I just don’t think that we’re going to be singing on the same page about this stuff. We could argue it all afternoon and it’s not going to matter. So it’s not really a jab at him as much as it’s more of an exploration for me. That’s a tough differentiation for some people to make. Stephen DePace liked this on Facebook. Madonna of the 40 oz !